Should You Hire A Lawyer For Your Maryland Auto Accident Case? This post won’t go into detail about whether you can or should handle a Maryland auto accident lawsuit by yourself–that’s a post for a different day (for information about filing a lawsuit on your own, see the legal Self-Help section of our website). Of course, the converse of each of these is also true. If you don’t mind spending the time to deal with the accident, you have enough PIP insurance, and you can handle your property damage issues, then you can do it all yourself. You can choose to hold off hiring a lawyer, or you might choose to just resolve the whole thing on your own. People who have limited medical treatment, for example a visit to the emergency room and maybe a primary care doctor appointment, can easily handle this on their own. The more medical treatment an auto accident victim has, though, the more complicated the case becomes. In those situations, it might be good to have the advice of a lawyer. Clearly, if the victim requires surgery, or is in treatment for more than 6 months, a lawyer is a good idea. Anywhere in between is something of a gray area. Most lawyers take auto accident cases on a contingency fee basis, which means that they get a percentage of the final settlement or verdict. Most lawyers’ agreements provide that the client gets 2/3 (66.66%) of any pre-lawsuit settlement, and 60% of any post-lawsuit settlement or verdict (this number doesn’t include expenses, which are usually modest in the smaller District Court-level automobile claims). The real question is whether the lawyer, either by adding his name or by expert negotiation/litigation skills, can increase your settlement or verdict by more than 2/3 (if pre-lawsuit) or 60% (if post-lawsuit). If so, you will do better by hiring a lawyer. 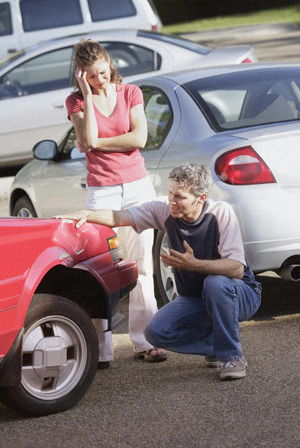 The reality is that insurance companies do tend to make higher offers to auto accident victims represented by lawyers. Sometimes it is enough of an increase to justify the attorneys’ fees; sometimes it is not. I suspect that the main reason is inertia–insurance companies know that an unrepresented accident victim who is negotiating his own case is already less likely to hire a lawyer under any circumstances–they will sometimes accept settlements because they don’t know what their case is worth; or they will sometimes accept settlements because it is easier to be done than to go that extra step to hire a lawyer. Once a lawyer is involved, however, the proper response to a low offer is to file a lawsuit, which puts the insurance company’s feet to the fire (some lawyers are settlement lawyers, and some lawyers are trial lawyers–you must make sure that you hire someone with a track record of going to trial). The only difficulty for most people is that it can be hard to know what their case is really worth, and what offer a lawyer would get. Check out the Maryland Auto Accident Settlement Calculator for more information. As a very rough rule of thumb, if the insurance company is not offering you a settlement that equals at least double your medical expenses, plus your lost wages, then they are not even trying to give you full value. In some cases, that number should be much higher than even that. You may be able to handle your own auto accident case, and that’s great. If you have general questions, feel free to give us a call. If you don’t want to take care of it by yourself, let us know at 443.850.4426, or send us a confidential online message.